The film's bloated ambition seems of a piece with its panting, happy-dog charm. 130 min. Universal Pictures. Directors: Stephen Sommers, Greg Michael. Cast: Brendan Fraser, Rachel Weisz, John Hannah, Arnold Vosloo, Oded Fehr. Writer-director Stephen Sommers keeps the good times rolling with The Mummy Returns, a horror-action sequel to 1999's The Mummy. To some degree, Sommers falls into the sequel trap, taking on more CGI special effects sequences than his budget and schedule could tastefully render, but the film's bloated ambition seems of a piece with its panting, happy-dog charm. Kidnappings and last-minute rescues are the order of the day as the O'Connells travel from their London mansion (Mentmore Towers, now better known as Wayne Manor in Batman Begins) back to Egypt for another tour of cobwebby tombs, magical artifacts, and creepy-crawlies. Even more so than in the first film, the plot here seems largely irrelevant, an excuse for action. Still, Sommers grounds it somewhat by perpetuating the core love stories from the first film. The Mummy Returns truly impresses in the funny byplay amongst the family. Adding a kid is usually the kiss of death to a franchise, but Sommers and his actors make the O'Connell dynamic shine with enough humor and heart to perfectly balance the dark and scary doings of the main plot. 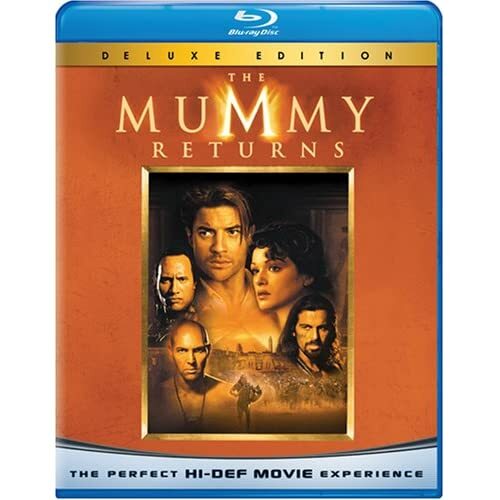 Universal makes its Blu-Ray debut with the Mummy franchise: sparkling new discs of The Mummy, The Mummy Returns, and The Scorpion King. The disc earns the title "Deluxe Edition"--fear no double-dipping on this one, folks: it's fully loaded. Though by design the sequel feels more digital and less natural than its predecessor, the high-def transfer is comparably excellent: the film looks just as good as it did on the big screen, if not better. The excessive effects sequences don't result in an inconsistent picture, thanks to the film's digital finishing; I would characterize the image quality as near-perfect. The muscular DTS-HD Master Audio soundtrack is also a knockout, with discrete effects, dialogue and music. First up is a Feature Commentary with writer/director Stephen Sommers and executive producer/editor Bob Ducsay. These old friends make great hosts, bantering through the ideas, the nuts and bolts and the anecdotes of the production. Via something Universal calls U-Control, Blu-Ray also offers a Picture-In-Picture video commentary, with interview clips from the archives popping up as you watch the film. It's a smart presentation of most of the behind-the-scenes content, with set footage and cast and crew interviews. Another menu option is My Scenes, a handy bookmark feature. Instead of deleted scenes, we get a very entertaining gag reel produced for cast and crew, labelled "Outtakes" (6:06). As on The Mummy disc, we get "The Mummy: Tomb of the Dragon Emperor Sneak Peek" (3:01), a featurette some may have seen in theatres as "pre-show entertainment." It's a whirlwhind tease with comments by director Rob Cohen, producers Stephen Sommers and Bob Ducsay, Brendan Fraser, Maria Bello, Luke Ford, Jet Li, and Michelle Yeoh. Visual and Special Effects Formation breaks down four key sequences: "Imhotep Returns," "Pygmy Mummies Attack," "Anubis Warriors Rising," and "Scorpion King Revealed." For each, we can select Conceptual Stage, Reference Plate or Animation Test, Plate Photography, Visual Effects Elements, or Final Feature Sequence. "An Army to Rule the World, Part 2" (5:59) is a brief featurette featuring Sommers, visual effects supervisor John Berton, producer Jim Jacks, and Arnold Vosloo hitting the main points about the film (Part 1 can be found on the Mummy disc). Doing double-duty from The Mummy disc is "Unraveling the Legacy of The Mummy" (8:07), which looks back to the character's history in a featurette surprisingly narrated by avant-garde filmmaker Guy Maddin (though he's uncredited). Interview subjects include Sommers, Fraser, Silent Screams: The Chronicles of Terror author Steve Haberman, producers Sean Daniel and James Jacks, Nightmare: The Birth of Horror author Christopher Frayling, special effects makeup artist Nick Dudman, The Essential Monster Movie Guide author Stephen Jones, visual effects supervisor John Berton, Rachel Weisz, and John Hannah. 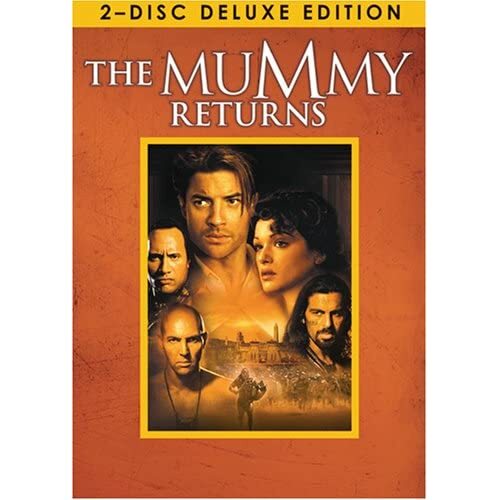 The most detailed making-of doc on the disc, "Spotlight On Location: The Making of The Mummy Returns" (20:03), is a familiarly styled HBO making-of, highlighting set footage and interviews with Sommers, Berton, Fraser, Jacks, Weisz, Hannah, Vosloo, Freddie Boath, Vosloo, Patricia Velasquez, and The Rock. There's also "An Exclusive Conversation with The Rock" (3:42), a weightless on-set chat in director's chairs. The Storyboard to Final Film Comparison section covers three key sequences: "Blimp Being Chased," "Pygmy Chase," and "Scorpion King Final Battle." Finally, we get a music video by Live, "Forever May Not Be Long Enough" (4:33). All site content © 2000-2019 Peter Canavese. Page generated at 04/21/2019 01:22:09AM.